Recommendations for companies that will do bottle labels with no minimum orders. Asking because they all seem to be good and I wanted to hear what companies others have used and who they like. We do all sorts of printing for Craft Spirts and specialize in price effectiveness on small runs. Feel free to reach out for one of our free sample packs! I'd be happy to send you material samples. Foils and embossing are a specialty of ours which are beautiful label enhancers. Send me an email and we'll take good care of you! 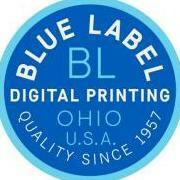 Blue Label Digital Printing is awesome. Pleasure to work with.